Jackson State University will hold a student symposium about Farish Street and the Jackson Civil Rights Movement on Thursday, September 28, at 2 p.m inside the theater of the JSU Student Center. A reception and unveiling of a new photography exhibit by civil rights activist and professor Doris Derby will follow. Undergraduate student Tiffanie Heron and graduate students Daniel Johnson, Marsha Watson, and Theron Wilkerson will discuss Farish Street and the Modern Civil Rights Movement. Luckett will moderate the panel. A reception will be held afterward in the Johnson Hall Art Department. 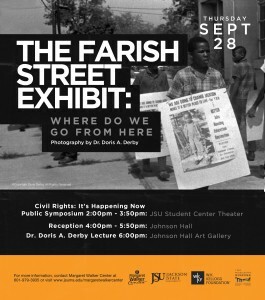 At 6 p.m. in the Johnson Hall Art Gallery, The Farish Street Exhibit: Where Do We Go from Here—a collection of Doris Derby’s photographs taken during the Civil Rights Movement—will be unveiled. Derby will deliver a lecture about her experiences on Farish Street. Farish Street was once the largest economically independent black community in the state. Businesses and organizations along Farish Street included Ace Records, the Lawyers Committee for Civil Rights Under the Law, the state conference of the National Association for the Advancement of Colored People, Trumpet Records and the Jackson Advocate—the oldest black newspaper in the state. The Farish Street Neighborhood Historic District was listed on the National Register of Historic Places in 1980. Civil Rights: It’s Happening Now is an outreach project developed by the Mississippi Department of Archives and History and the Mississippi Civil Rights Museum for emerging researchers. The project provides opportunities for researchers to explore documents, images, and other research material found in the distinctive collections of the Mississippi Department of Archives and History that may inform their work in the area of racial equity. The Mississippi Civil Rights Museum and Museum of Mississippi History will open on Saturday, December 9, 2017, in Jackson as the centerpiece of the state’s bicentennial celebration. Supported by the W.K. Kellogg Foundation, the Farish Street Exhibit and student symposium are presented in collaboration with the Mississippi Civil Rights Museum, the Mississippi Department of Archives and History, and the Margaret Walker Center at Jackson State Universiy. For more information, contact Stephenie Morrisey at 601-576-6545 or the Margaret Walker Center’s staff at 601-979-3935 or mwa@jsums.edu.